Happy Friday! This was a short week, but a very busy one. Thank you to those who attended our Home and School sponsored Grotto’s Night. It is always nice to spend time together over a meal. That has become something we are well known for in this Italian parish. We love chances to get together and be social. You do not have to be Italian to enjoy that fellowship. Please keep an eye on our calendar, as we have several nights planned to dine out thanks to Ms. Frederick doing her research on restaurants that donate money to schools. Our next Restaurant Night is Tuesday, October 23rd at the Shake Shack in the Christiana Fashion Center, across from Christiana Mall. Today at Mass, Father Mark read a Gospel reading that was about demons. He put a nice twist on the somewhat gloomy reading. He simplified the reading for our students and compared demons to bad things in our life. He said that sometimes we get rid of the “bad” in ourselves, yet those bad things creep back in. He urged the children to become what God wants them to be, the best version of themselves. We should strive to be better people and become more like Jesus. He suggested substituting bad things in our lives for good ones. He gave the example of gossiping. If we have a tendency to gossip and talk badly about others, he asked that we try to start saying nice things about people. Eventually, just like the evil tendencies, speaking kindly will become a habit. He suggested we look to the things that are negative in our lives, even if it is something as simple as procrastination with homework. He reminded us that if we keep busy tending to the things we should tend to that there would be very little room for bad things “demons” to enter into our lives. I love starting Fridays with Mass! Please join us if you have yet to do so. The children do an amazing job preparing the readings and participating. Our Antonians sing beautifully. We have been singing the songs for our Diocesan theme this year. The songs will remind you of your childhood! They all encourage us to celebrate the day that the Lord has made for us, to be glad, and to REJOICE! At the end of each Mass, Father Mark gives everyone a round of applause. That is a habit unique to him, and the children really like his special acknowledgement. 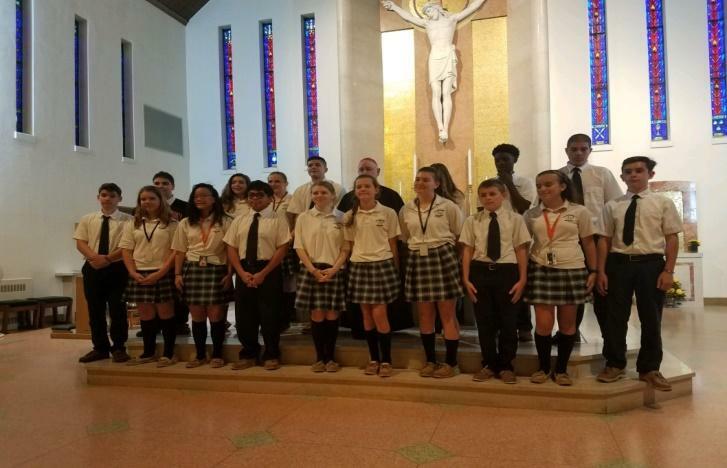 8Th Grade is pictured here at Holy Spirit Church! This past Thursday they celebrated the Feast of Our Lady of the Rosary with other Diocesan schools. They prayed the Rosary with Bishop Malooly and then had their pictures taken outside with the Marian statue. It was a special day celebrating one of the many traditions of our Catholic faith – the Rosary. 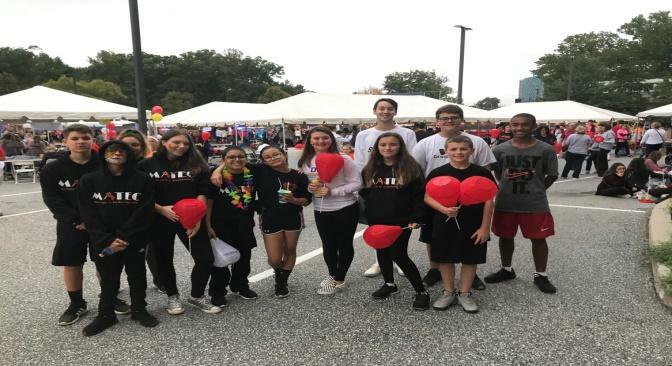 Thank you to everyone who came out to the Light the Night Walk to walk with Mateo Ahumada! Mateo is bravely battling Leukemia and is attempting to complete his 8thgrade year with his classmates. He was thrilled with the turnout from his peers and some families. It was a very emotional night for me and especially for Mateo’s mom, Carmen. We talked about how fast things can change in your life; in the blink of an eye. One day your child is running around and playing. The next thing you know, you are helpless and listening to doctors’ talk about cancer, referring to that very same child. We both felt extremely blessed this year. My son is in remission (2 years) and was able to come home from college and walk with his former church buddy, Mateo. Last year, Mateo was too sick to walk and was watching from the hospital window, the same window my son and I spent over a year sleeping next to. Mateo was full of smiles this year. His energy was contagious. That day, his mom doubted he would be able to do it, thinking he looked too tired. Hours later, Mateo was dancing around with his friends, getting his face painted, and enjoying the night. God was good to us, and we had a lot of reasons to REJOICE that evening. Thank you again for your continued prayers for the Ahumada family! If a relative or friend is going to pick-up your child or children from Aftercare, please make sure they are aware that the pick-up procedure requires an adult to sign the child out in the office before going to the Aftercare room to get the child. Children must be picked up by 6:00 p.m. when Aftercare closes. There will be a $10 late fee assessed for late pick-ups. Families who are consistently late picking up their children will forfeit their aftercare spot. Outstanding balances on Aftercare accounts must be paid by the last day of the month to continue using the Aftercare program. Thank you for choosing St. Anthony’s and your cooperation with our Aftercare program guidelines. Student Council has many activities planned for this year. Next week, Student Council officers will be selling bracelets. The cost is $1 for rubber and yarn bracelets and $2 for beaded bracelets. Student Council will also be selling apple cider. A form will be going home next week. We are asking for pre-orders so we can order the correct amount of apple cider. During the week of Halloween, they will be having a candy corn count. Chances are 1 guess for $0.50 or 3 guesses for $1.00. During November, we will hold our annual Food Drive. More information will come out as we get closer to the event. Parent/Teacher Conferences are on Thursday, October 25th, following our Noon Dismissal for Grandparents Day! Conference forms were sent home with the youngest child in each family on Wednesday. Please return these forms to school by Monday, October 15th so our teachers can schedule conferences. The Scholastic Book Fair will be held October 24th – October 26th. This event is always very popular on Grandparents’ Day. Due to the overwhelming amount of people who try to go during the few hours they have here at school, the Book Fair will remain open after the noon dismissal on Grandparents’ Day. Students will also be able to shop on Wednesday and Friday. We will have a Dress Down Day/Dress-up for Halloween, on October 31st. The cost to participate is $2.00 and the money raised will be donated to the Diocese in celebration of their 150th Anniversary and to help fund the beautiful painting of our Blessed Mother given to Bishop Malooly this past weekend. The children will be able to view this painting and hear the story of its creation within the next couple of weeks. Altar Servers Needed – We are looking for students from 4th to 8th grades who might be interested in joining our Altar Server Program. We will have an information session with Father Mark for interested students on Friday, October 19th, at 2:00 P.M. in the church. Please let Mr. Shields know if your child or children are interested. Email Mr. Shields at bshields@stanthonynet.org or call the office at (302) 421-3743. Thank you! Monday, December 10th – Grub Burger and Barnes & Noble Night on 202. All of the restaurants are all day events meaning there is no set time that you need to go for them to donate to our school. We will be sending more information home on Wednesdays in the white envelopes. This is a great way to support our school and enjoy some delicious food. There will be no Tiger Talk on October 26th! I will be at a Middle School Educators Conference in Orlando that week! Please continue to follow us on Facebook and to check our school website calendar for upcoming events.